It's located in Hanaizumi-machi, Ichinoseki, Iwate Pref. 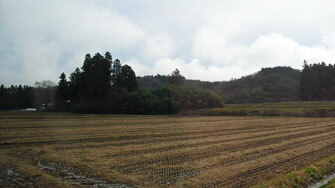 There is found a continuous traditional culture of O-mochi, rice cake. Visited an old folk house that was built up over a century. Shown into the long, long parlor that may seem 13 meters long, surrounded by Engawa (veranda-like porch) and Fusuma (sliding door). There are also found many ancestral portraits, diplomas, etc. on the wall. Here are various rice cake dishes. 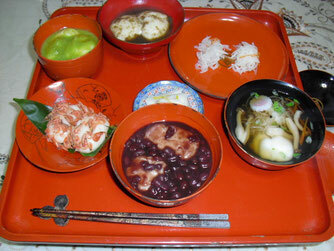 Anko-mochi (sweet bean paste), Ebi-mochi (freshwater shrinp), Jinda-mochi (sweet soybean paste), Goboh-mochi (grated burdock roots), Namasu-mochi (pickled radish and carrot) and Zouni-mochi (various vegetables). Thank you for the delicious meal ! By appointment only ! It's located in the middle of countryside.